Raised to be a warrior, seventeen-year-old Eelyn fights alongside her Aska clansmen in an ancient rivalry against the Riki clan. Her life is brutal but simple: fight and survive. Until the day she sees the impossible on the battlefield – her brother, fighting with the enemy – the brother she watched die five years ago. Faced with her brother’s betrayal, she must survive the winter in the mountains with the Riki, in a village where every neighbour is an enemy, every battle scar possibly one she delivered. But when the Riki village is raided by a ruthless clan thought to be a legend. Eelyn is even more desperate to get back to her beloved family. She is given no choice but to trust Fiske, her brother’s friend, who sees her as a threat. They must do the impossible: unite the clans to fight together, or risk being slaughtered one by one. Driven by a love for clan and her growing love for Fiske. Eeelyn must confront her own definition of loyalty and family while daring to put her faith in the people she’s spent her life hating. History is full of surprises. Over the last century our perception of Vikings has evolved considerably from the almost comical horn helmeted raiders we instead are now increasingly aware of their way of life and culture. In the last decade we have even seen some archaeological evidence that the Vikings have had women as warriors – their culture continues to surprise and entice us. In this enthralling historical novel Adrienne Young provides an insight into what such a warrior would be like and it is a compelling read. Our narrator is Eelyn one of the Aska warriors on the coast who every five years fight with their mountain based ancient rivals the Riki. Its fierce battling for survival and Eelyn is a very capable fighter using two weapons to battle her enemies. But in one encounter during fighting season she appears to be saved by her brother – who was last seen dead five years ago. Possibly a spirit sent by the gods? Eelyn keeps watch for a second reappearance and then finds her brother now clearly fighting as one of the Riki. Before she can confront him, she however is captured and sent to the Riki camp – to be treated as a slave serving her captor’s family. She finds the truth about her brother but also eventually finds that a much bigger and vicious force that has both the Riki and Aska in their sights and Eelyn starts to wonder if the ancient rivalry needs to be put aside. I think the key draw to be in this novel is Eelyn. We often tend to get either a stereotypical warrior who authors want to make ‘one of the lads’ or the cunning fighter who as soon as she meets a man, she loses all agency of her own and falls in love. Young delivers however a much more nuanced and thoughtful warrior. Fighting your rival clans is part of life but we see the bonds she has with her friends and family; her proficiency with weapons and combat but also a love of the way of life – be that the food, religion or morality. She’s capable but not a zealot but as we see once she’s captured, she must debate whether she should go down fighting or even commit suicide to protect her own soul. Alongside this she is working out her own guilt and reaction to her brother’s reappearance. 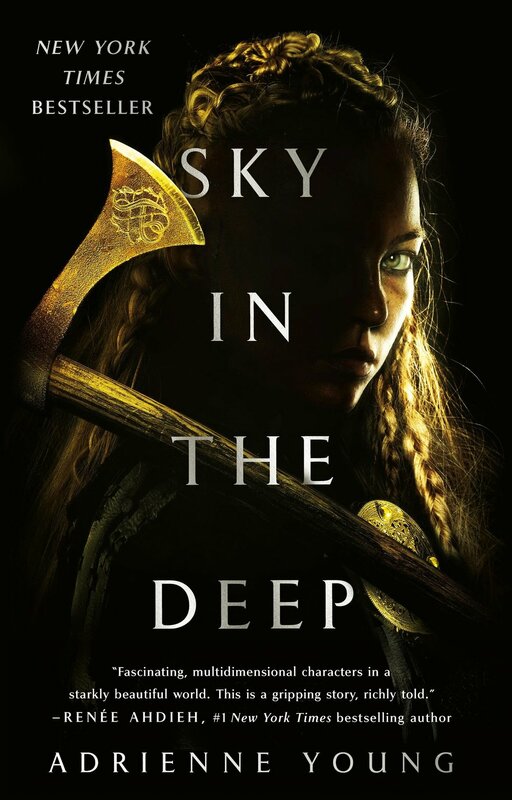 Young make you understand Eelyn’s internal struggle and that’s a huge key to both understanding the wider world of the clans as well as making us care about where the story is going. I really enjoyed the way these clans come alive in my mind. They share some aspects, but each has subtle differences be that their myths; the commemoration of the dead or even forms of technology. Evenly matched but clearly enemies and as we move across the clans, we see those on both sides who have either been injured or lost relatives and this poses a huge obstacle when the new enemy arises. It does however make the reader care about both groups and you want the two groups to realise that compromise even if temporary is the better options when up against annihilation. These slices of village life though are interludes and we are constantly reminded that violence and death are also a key part of life in the fjords. Scenes of family feasting need to contrast with the vicious torture of a prisoner, and this escalates to the final momentous battle for supremacy that re minds you for the Vikings fighting was a skill and a final way to end matters. I think my one niggle with the story is it is never really clear why the two clans have continued to fight every five years rather than find a better way to live alongside one another rather than delete each other of resources. Its mentioned as a religious matter but it doesn’t quite ring true. Happily, for me the emotional plot of Eelyn and the clans manages to make you put aide the questioning of how feasible the set-up is and instead you just want to get to what you hope will be a satisfactory resolution. I really enjoyed Young’s style of writing – it is very short and precise (suiting Eelyn’s nature) but allows her to paint a picture of a way of life or an emotional internal struggle quickly and I was soon invested in the story and wanted to know how the story would pan out. If you fancy a historical novel that gives you a well-rounded lead warrior and an intriguing mystery, then I think this would be a great place to start.